Also serving communities of Berthoud, Estes Park. There are 22 Assisted Living Facilities in the Loveland area, with 14 in Loveland and 8 nearby. The average cost of assisted living in Loveland is $3,202 per month. This is lower than the national median of $3,346. To help you with your search, browse the 97 reviews below for assisted living facilities in Loveland. On average, consumers rate assisted living in Loveland 4.1 out of 5 stars. Better rated regions include Windsor with an average rating of 4.8 out of 5 stars. Caring.com has helped 6 families in Loveland find high-quality senior care. To speak with one of our Family Advisors about assisted living options and costs in Loveland, call (855) 863-8283. The city of Loveland is located in Larimer County, 46 miles north of the Colorado State Capitol in Denver, and is nicknamed both "Sweetheart City" and "Gateway to the Rockies." The Loveland, Colorado area is home to 38 Assisted Living Facilities with 14 located in Loveland and an additional 24 in the surrounding area. These communities are governed by the Department of Public Health and Environment, Health Facilities and Emergency Medical Services Division. families so they can stay informed about local ALF standards. Larimer County is a member of the AARP Network of Age-Friendly Communities, meaning that its elected leadership “has made the commitment to actively work toward making their town, city or county a great place for people of all ages,” according to AARP. Seniors with a respiratory illness or chronic bronchitis should be aware that The American Lung Association gave Larimer County an Ozone rating F and Particle Pollution 24-hour score of C. These poor air quality ratings could be problematic for individuals with sensitive lungs. The cost of living in Colorado is 16.7 percent higher than the national average, while Loveland is 16.2 percent higher, making it slightly more affordable compared to the rest of the state. The Loveland community enjoys a very low rate of violent crime. With a score of 14.6 out of 100 (1 being the safest) compared to the U. S. average of 31.1, seniors and their visitors can have peace of mind about being in the area. The property crime is also less than the national average at 36 versus 38.1. With an average January low of 15 degrees and 26 inches of snow per year, the weather may be difficult for some to tolerate. 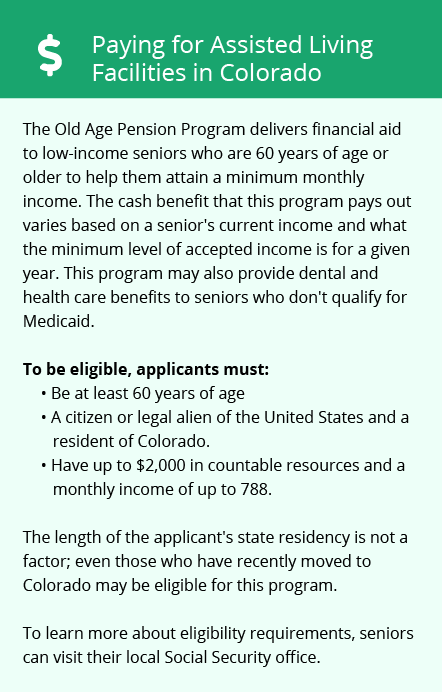 The state of Colorado offers several tax benefits to seniors and retirees. Social security is only partially taxed, while medicine and groceries are exempt. This could help seniors looking to save a little money. Assisted Living costs in Loveland start around $3,202 per month on average, while the nationwide average cost of assisted living is $4,000 per month, according to the latest figures from Genworth’s Cost of Care Survey. It’s important to note that assisted living rates in Loveland and the surrounding suburbs can vary widely based on factors such as location, the level of care needed, apartment size and the types of amenities offered at each community. 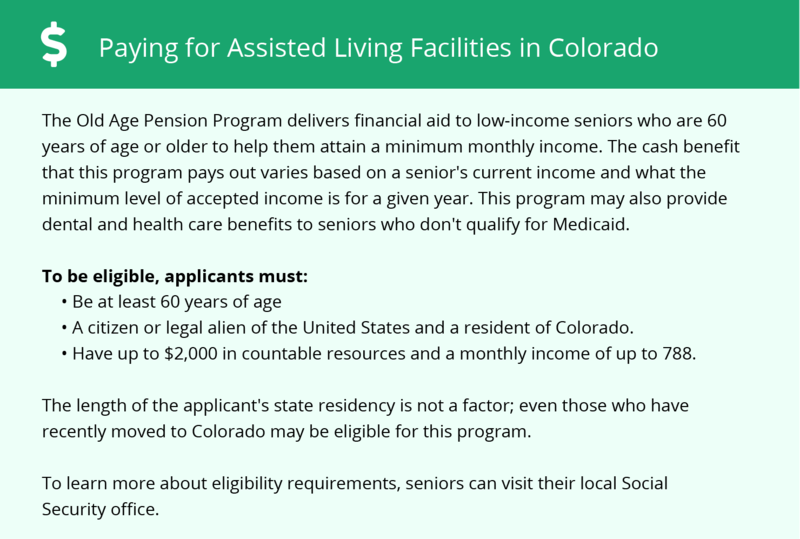 Health First Colorado, the state's Medicaid plan, helps qualified seniors pay for assisted living costs. In addition, eligible residents can take advantage of the state's waiver programs and several other programs that aren't state funded. To see a list of free assisted living resources in Loveland, please visit our Assisted Living in Colorado page. Loveland-area assisted living communities must adhere to the comprehensive set of state laws and regulations that all assisted living communities in Colorado are required to follow. Visit our Assisted Living in Colorado page for more information about these laws.